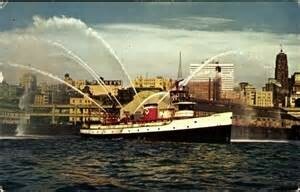 The worlds most powerful fireboat from 1909 to 2003 pumping 22,800 gallons per minute. 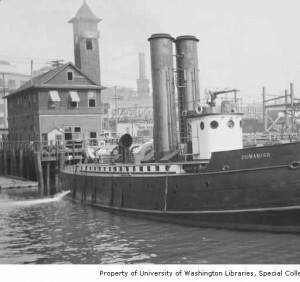 The Seattle Fireboat Duwamish, built in 1909, is the second oldest fireboat in the United States. A National Historic Landmark, and a City of Seattle Landmark, it is moored at the Historic Ships Wharf at South Lake Union. Dedicated to the preservation and interpretation of Seattle’s firefighting history and the maritime industry, the Seattle Fireboat Duwamish is specifically interested in the education and development of future Mariners. Built at Richmond Beach Shipbuilding Co. aka, Puget Sound Shipbuilding Co. Originally built in 1909 as a steam ship, and rebuilt in 1949 as a diesel electric ship powered by two Cooper Bessemer Supercharged 900 HP engines powering two 1945 General Electric DC 765 HP electric motors, with two Detroit Diesel 671 auxiliary engines. The first fire the Duwamish fought was on May 20, 1910 for the Independent Asphalt Co. The last fire the Duwamish fought was on West Marginal Way in September 8, 1984. Welcome Aboard the Seattle Fireboat Duwamish! Mary on Welcome Aboard the Seattle Fireboat Duwamish! Steven Walker on Welcome Aboard the Seattle Fireboat Duwamish!